This past weekend for thanksgiving I had decided to venture off to DC to do some sight-seeing and to also enjoy spending time with my best friend. To be honest, my trip to DC was all an excuse to just eat some good ol home-made Vietnamese food. And to possibly run into president Obama while he was still in office. Did I get to meet president Obama during this trip…. not really but I did have the opportunity to eat some great Vietnamese food and to check out the Abraham Lincoln memorial which is a definite must. Taking a trip over to Washington DC is fairly easy to do so from NYC thanks to bus lines such as Mega Bus and Vamoose. There are a lot of cool things to check out while in DC such as the many museums conveniently located in the center of the district. Neighborhoods like George town definitely attracts a great crowd, and while visiting why not check out the white house, the Korean Memorial and the pentagon. While there don’t forget to try George town cupcakes which have built some notoriety in the DC area. The fast paced yet traditional Republic of Korea is a place full of unique opportunities that lure expats from all over the world. 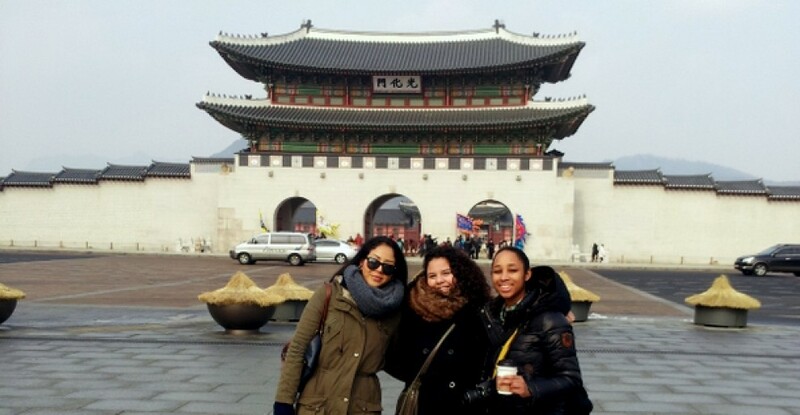 Although something that expats learn very quickly is that the cost of living in South Korea is quite expensive on many levels, yet if you are easy going and flexible, adjusting to your new life in this foreign country might be easier than you think. Nonetheless, you’ll need to understand how much everything will cost you in South Korea before you land. Unless your employer has your housing sorted for you the minute you land, you should have to have enough money for budget accommodation and expenses for at least a month. Daily expenses will vary from person-to-person, depending on your tolerance for local food. Moon Living Abroad in South Korea by Jonathan Hopfner explains that $1000 to $2000 should be ample for single travelers living in cheap accommodation, while $5000 to $6000 would suffice for a family in a serviced apartment or a decent hotel for the same period. Take note that this number does not include expenses that you have to pay before arrival, such as your plane ticket. Normally for international flights, travelers will refer to cheap flight websites however you should be wary of the hidden costs many tickets fail to advertise clearly. The same blog post by Parking4Less points out a few of these hidden costs, including added taxes and fuel surcharges, as well as baggage charges. Typical accommodation will have most, if not all, the modern facilities you would expect. However, ExpatArrivals.com says that the cost per square feet and deposits, especially in Seoul, are much steeper than most countries. Either be prepared to spend a hefty amount of your savings, or make sure that your company provides you with a housing allowance. On the bright side, most expats will find the daily expenses quite affordable and find it quite easy to save money. The streets of big cities are packed with local restaurants with appealing menus. With all this competition, expect the prices of good Korean food to be low. Plus, other services such as public transport, utilities, groceries, and even alcohol are quite reasonably priced in comparison to most western countries. Thus, even if prices of accommodation are quite drastic, day-to-day living is still economical. Oh Canada, this past weekend I had decided to go on a spur of the moment kind of trip to Canada, the home of the infamous “Eh”. I checked out Niagara Falls and Toronto, which in their own right had a lot of charm. Niagara Falls is a definite must see, it generates 18% of the worlds fresh water supply. There is this myth tied to the falls that trails back for many generations regarding love. There are a few superstitions regarding the aphrodisiac powers that the mists generated by omitting electrical impulses that stimulate feelings of romance. Like that John Paul song, ” Love is in the air. Everywhere I look around.” Hearing the water crash against’s the rocks took a melodic tune that was in fact relaxing to listen to, and although I might of not felt swooned by the motions of it all, it didn’t take long for me to admire the beauty of it all, being fully present and witnessing all of its great ferocity. Niagara Falls on the Canada side has this almost child like park theme to it. Cartoons, arcades, cotton candy, screaming kids and all. I didn’t stay too long, for fear of getting the cooties, but it was interesting to check it out just once. I was then back on the road heading down to Toronto, the home of Hockey Puck. This is how things had played out for me in Toronto. Me, wandering aimlessly around asking directions to stranger’s for restaurants near by. I approached a heavily tattooed women with trendy glasses, ” excuse me, by any chance would you happen to know where there is any good food around here?” she studied me while scratching her head bobbing her head side to side, ” umm sure, go down that way and then head south.” In my mind I had thought hmm south, I wonder where that could be? I quickly thanked her and walked away unsure of which way to go. I then asked another pedestrian and their reply was similar, ” yeah… just head South East”. This in all fairness left me very confused at the end. Thank goodness for my handy friend called google maps, I was able to find my way. I also had experienced feelings of confusion heading over to a grocery store in search of purchasing some beer. I could not find beer anywhere, aside from bars and liquor stores. I approached the grocery clerk and had asked, ” hey, do you guys sell any beer here”, he looked at me with a puzzled expression and replied, ” …. we don’t sell beer, you can only buy beer at the beer store.” At first I thought he was joking, but no he was correct, apparently Canada has some very strict set laws about selling beers in stores, that are not controlled by the LCBO (Liquor Control Board of Ontario). Toronto, is a fresh city that has pretty physically fit population and whose art scene is pretty trendy, with art work displayed everywhere and loaded with tons of restaurants to satisfy any food critics heart here in NYC. Its also a very friendly bicycle friendly city, so watch out when you see a stampede of cyclist heading your direction. 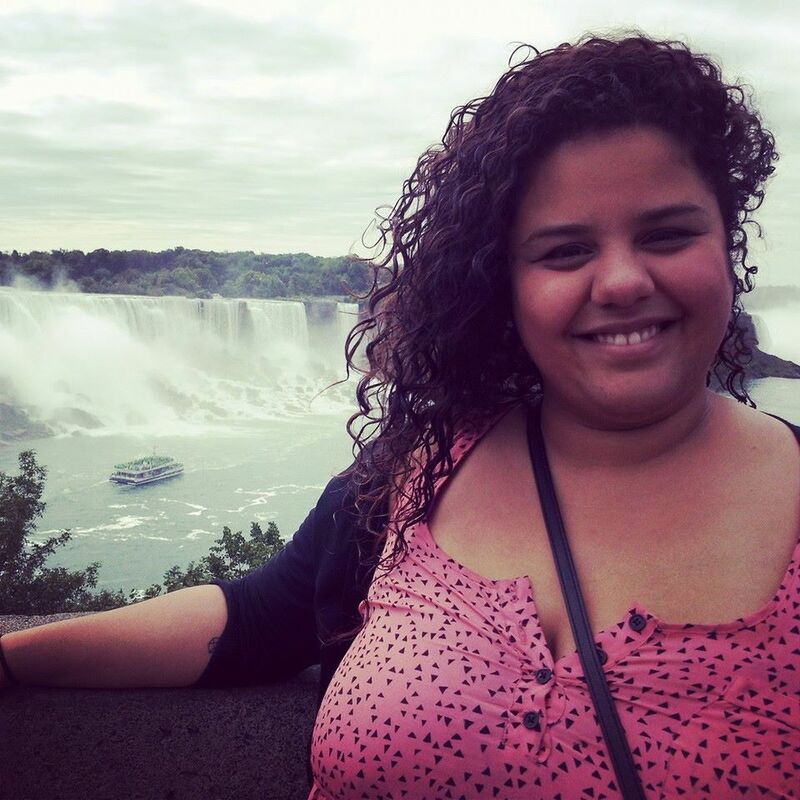 If you are thinking about heading to Niagara or Toronto, you should definitely go. I had fun, and I’m sure you will too. By the way, Canadian’s are some of the most friendliest people , so don’t hesitate to pop up and say hola. 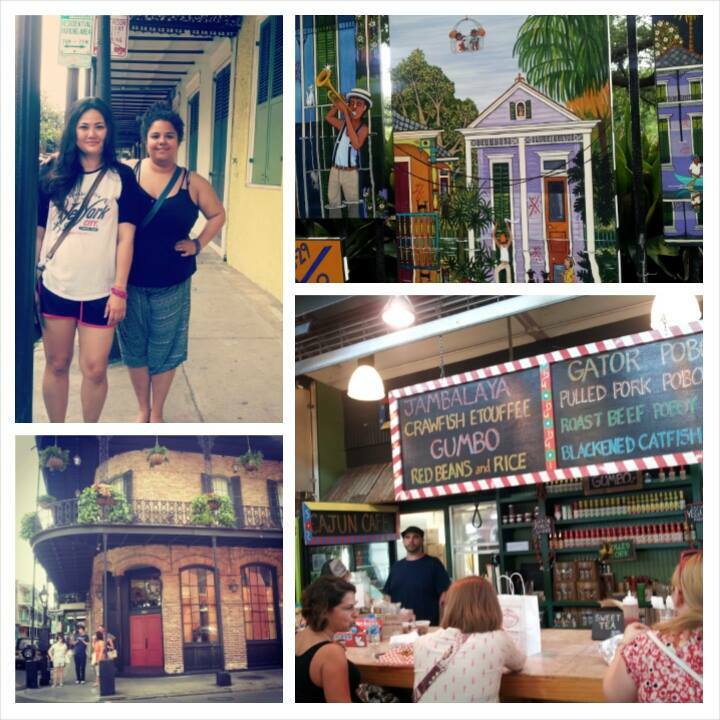 What comes to mind you when you think of New Orleans? Some say flavor others say spice; well I declare my dear’s, it’s all that jazz and more. Like Chris Rose once said, “We dance even if there’s no radio. We drink at funerals. We talk too much and laugh too loud and live too large and, frankly, we’re suspicious of others who don’t.” This city is incredibly rich in culture, food, artistry and most importantly music. Now visiting the city post Katrina was a delight because the streets were buzzing which brought a ton of revenue to the city for the necessary repairs needed to bring it back to its glory. Tourists and locals aimlessly roamed the streets looking for some grub while enjoying the simplicity of the laid back life style. I was taken aback by the fact that when you enter the city you feel its presence immediately, like a baby seeing its mother for the first time. Something just felt right. Perhaps it was due to the colors of the buildings, all the crawfish signs, drink specials in every corner, and the non-stop rhythm of music blasting from different sites all over the city. 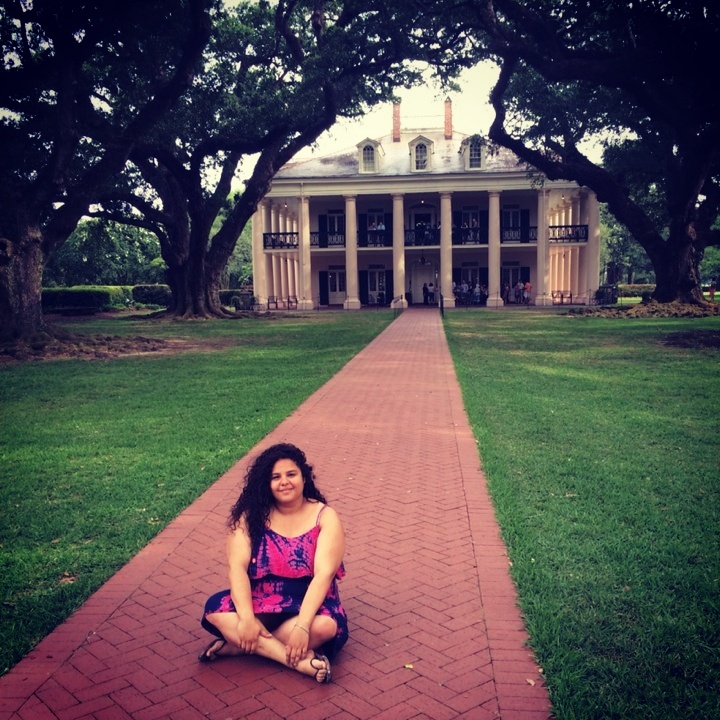 There are tons of things to go see and do in the city such as the following; Swamp Tours, Ghost Tours, Voodoo Tours, French Quarter Tours, Cajun Tours, Cemetery Tours, Plantation Tours, Jazz Tours, and every other possible tour that you can think of. I on the other hand opted for the Swamp tour and the Plantation tour which were amazing to witness because duh why wouldn’t it be hehe. Also due to budgetary issues, I couldn’t do it all. But hey that’s life I ended up just going to the other places by public transportation which was affordable and pretty easy to do, being that the city has a great tram service that gets you from point A to B it was fairly easy to get around. 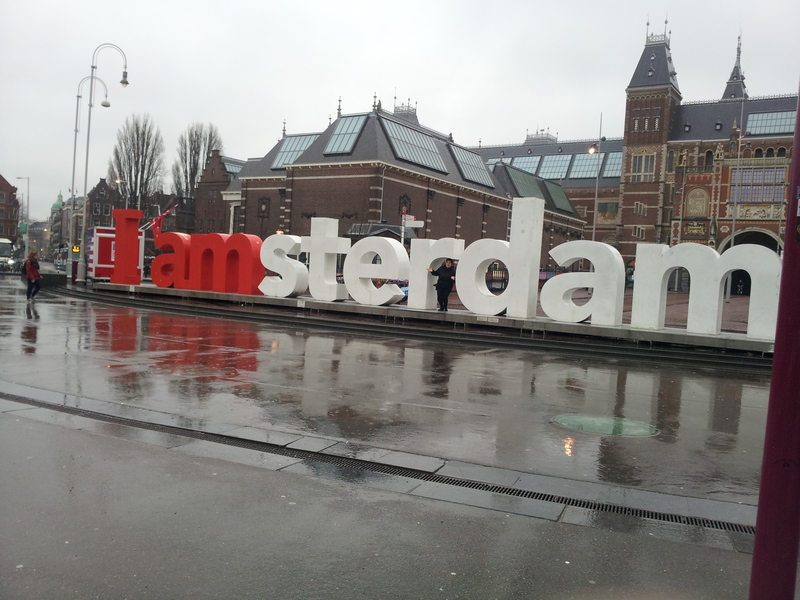 Wow, is all that I can say about Amsterdam. Was it everything that I could of imagined it to be? well yes and no. The mad cyclists whizzing down the streets, at times close to running me over was a lot to take in. In addition, the strong odor of marijuana that hovered over the ENTIRE CITY! was well… lets just say interesting. This city is intense, but not so much, if that makes any sense. There are a ton of awesome things to check out in this city such as checking out the Heineken Factory tour, going to the Anne Frank Museum, going to the Van Gogh Museum and much more. Would I go again? heck yeah. Just keep in mind, that you need to bring a lot of cash. This place is definitely not budget friendly for those of you on a very limited budget. The Book of Kells which is a must see if you’re visiting Dublin, is located in the Trinity Library. In case for those of you who are wondering what it is, it’s a manuscript gospel book containing four gospels of the new testament which was created by a bunch of Celtic monks during the year 800. 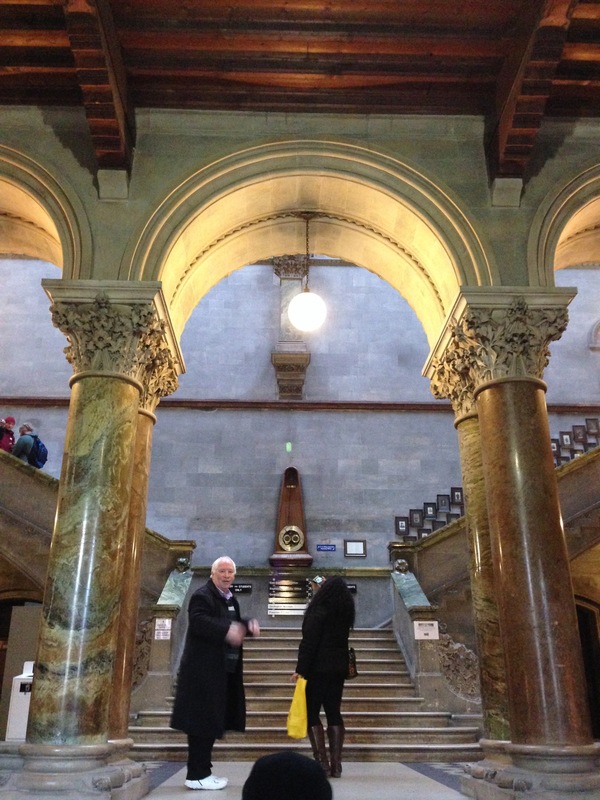 It’s considered a treasured possession by the Irish and with the admission ticket which cost about 12 euro includes access to the Trinity Library which was the inspiration for some of the scenes in the film Harry Potter. Dublin is a writer’s paradise, for it encompasses great literal works by famous irish writers such as Oscar Wild, James Joyce, Bram Stoker. The Irish are a very proud bunch, who enjoy hearty meals such as a tasty home made shepherd’s pie along with a tall pint of Guinness to help accompany it. 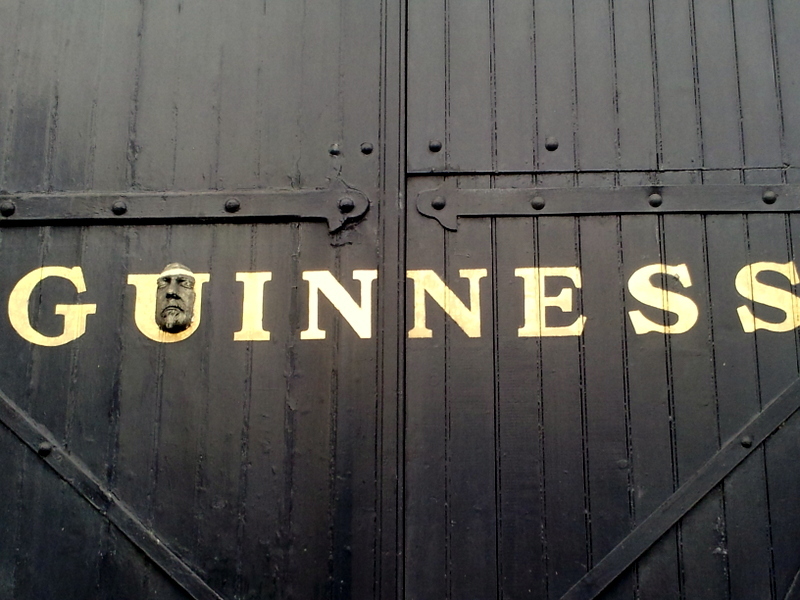 The Guinness factory is located in St James’s Gate, Dublin 8, Ireland and the total tour entry cost will set you back $16 Euros. You get a tour of the factory and you would get properly educated on the necessary steps in creating the perfect brew and also dispensing a proper pint. The factory is huge, and with good reason, they ship their product to over 100 countries. The tour is self guided; you are led by a ton of visuals, that details its history and ingredients. The cool thing about the tour is that the factory has about 7 floors that you can visit, so you get an extensive overview of what makes Guinness so great. I myself have never been to fond of the stout itself but now that I have learnt how to properly pour a pint of Guinness and drink it the correct way which is elbow raised up to your chest, with a straight view of the horizon and a long strong gulp to set the flavor at bay. The great thing about the tour is that at the end you get to enjoy a nice pint at the tower which gives you a great view of the entire city. 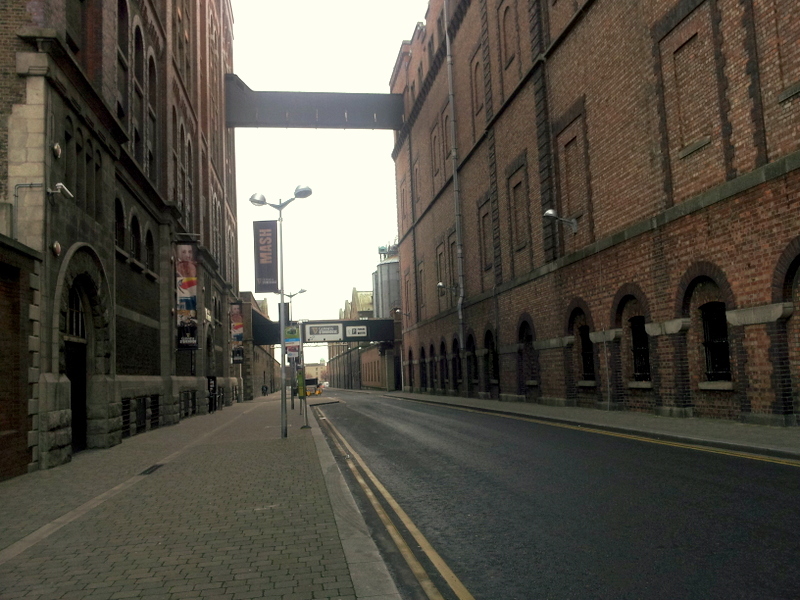 The Jameson distillery which is conveniently located close to the Guinness factory was interesting to go to, its actually a short taxi cab ride away. The tour itself was rather shorter than what I expected. 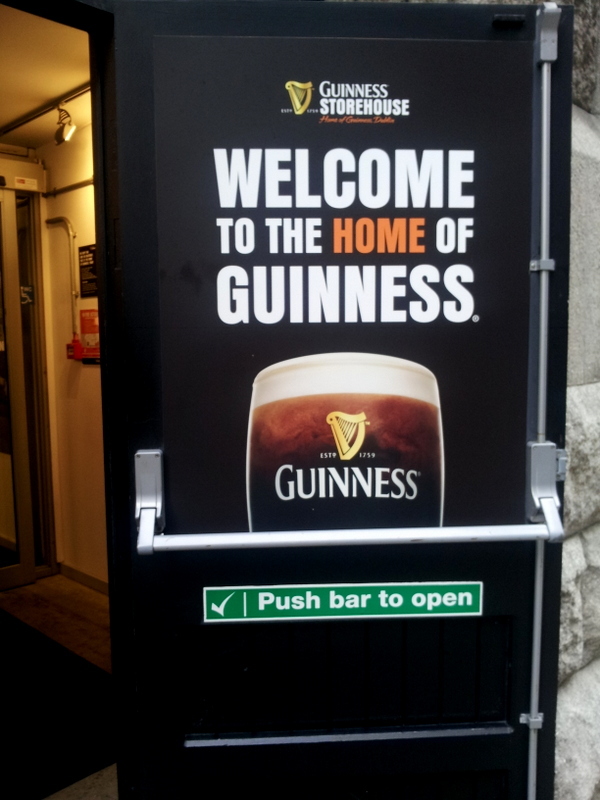 Since I went the same day as the Guinness tour I was a tad bit disappointed. The tour cost was 16 Euros and included a shot of Jameson at the end. The tour guide was the most interesting part of the tour for his humor and his thorough knowledge on the history of Jameson, and the fact that what separates this whiskey from other famous world known whiskeys like Jack Daniels and Johnny Walker is that Jameson and most other Irish Whiskeys are distilled 3 times, which gives it a smooth taste despite how harsh it can smell. My opinion about the tour taken into consideration that this particular distillery is no longer a functioning distillery can be passed. You don’t get as much bang for your buck. The tour is rather short, and you get the feeling of being rushed in and rushed out which was quite disappointing. That being said, the Jameson Distillery can be bypassed, unless you are a big fan, and would like to purchase an exclusive bottle of Jameson Whiskey only distributed in Ireland. 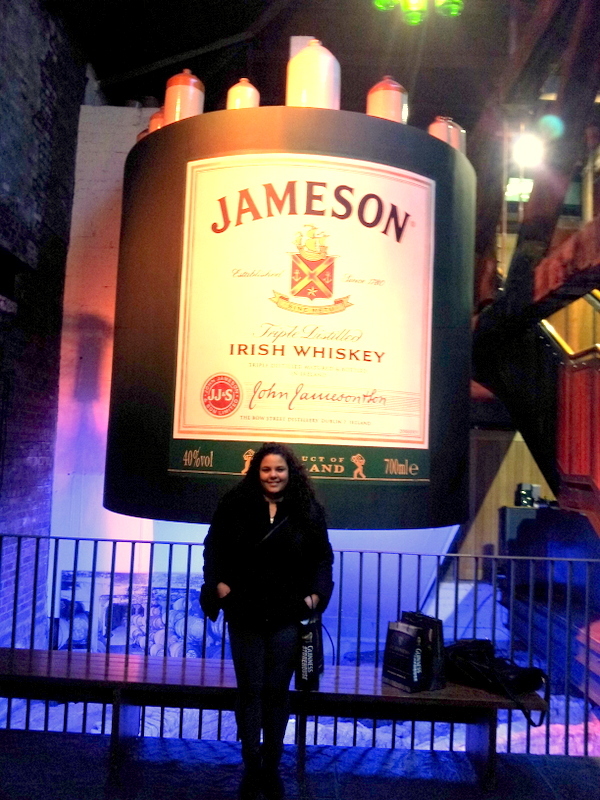 As one yelp reviewer named mallory had said, ” Maybe the Old Jameson Distillery tour would be cool if the Guinness tour didn’t exist…but unfortunately for Jameson, it does. And this paled in comparison.Where the Guinness experience was very interactive and encompassed all aspects of the brewery, I felt that Jameson was one dimensional . There’s lots of herding into small rooms to watch videos. The video in the beginning of the tour is way cheesy and a bit too long. From that point on it is basically walking around looking at dioramas depicting the brewing process.The coolest part was the opportunity to do a taste comparison at the end. Unfortunately only a handful of people got to partake and I wasn’t one of them. Sad face. At the end of the tour everyone did get either a glass of Jameson or a Jameson cocktail which was a nice touch.While the liquor was good and the people friendly, this tour seemed lacking to me”. I have also provided a funny tour of the Guinness Factory by the funny comedian conan o’brien.